since the beginning of Ribalon, I increasingly started to receive all sorts of invitations to various meetings, seminars and workshop about how I should run my business. From companies, agents, all sorts of “professionals” (real or fake). When I answered and attended some, I’ve been advised to use a certain marketing strategy, was taught how to write a business plan and how to sell my services. All in terms to attract more “customers”, to bring in some investors, to increase productivity with as little efforts as possible, etc. In general – how the business should be, from the bottom down and reverse. It was not advice form a friend, but rather a comment from an expert who was convinced knows better about my company than I do. Guess what. How I run my business is non of their business. I don’t want to increase my productivity by appointing 10 clients a day. I rather do just one, but really do a great job with “only” one. I don’t want to “sell” my services. They are not to be sold. They are to make people’s lives better. I don’t want to adjust my price to the market. Quality has no “price”. 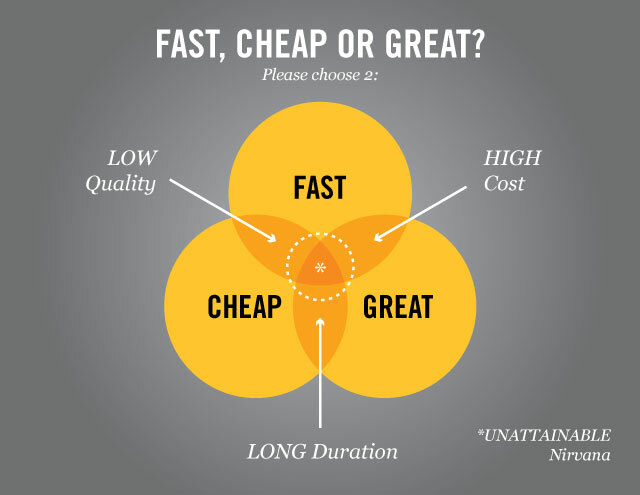 I believe in the triangulation cheap – fast – good cannot go together (see the picture below). You have to pick the combination of the two you like. So if you want it good and fast, it’s not gonna be cheap, But if you want it to be fast and cheap, it’s not going to be good. I somehow refuse to do that. Your choice. I don’t want to create the needs in people, so that they would need my services and would keep coming back. I want them to fly and to leave me as soon as possible, because this means they have taken up with their lives and I’ve done my job well. I don’t want advice from someone who doesn’t care and only wants to make profits. But I do value feedback from people who do care. Who want to make this world a better place. Who want to see me grow, because they believe I do a good job. Who want to share their knowledge because they know it’s not theirs to keep it. Who care about other people. And environment. And who don’t think numbers, but instead think melodies. I don’t want to make my company an investment opportunity for people who would like to buy it and later on sell it to a third party who pollutes our waters. Instead I want to sleep well at night and I want to keep the feeling that I love my job and that what I’m doing is exactly what I want and how I want. At the end of my life I want to look back and count all the memories I’ve created and I want to open my box where I keep them and read about all the stories from many people that I (hopefully have) touched. And I want to remember all the wonderful people I had an opportunity to learn from and create together. That’s my business strategy. I want to make it the hard way. I want to put much efforts to it. I know I could probably buy my doctorate and nobody would find out, but what quality and worth would that have? For others? For me? So I’ve created a filter and marked all these offers to make me a super modern enterpreneur a spam. Appologies if I’ve ofended someone. But I’m not sorry. Now I’m off to do a two-day training at some new organization I’ve never worked with before. I’m really excited to meet and work with new people. Every time it’s different. And I remember each meeting as something magical.